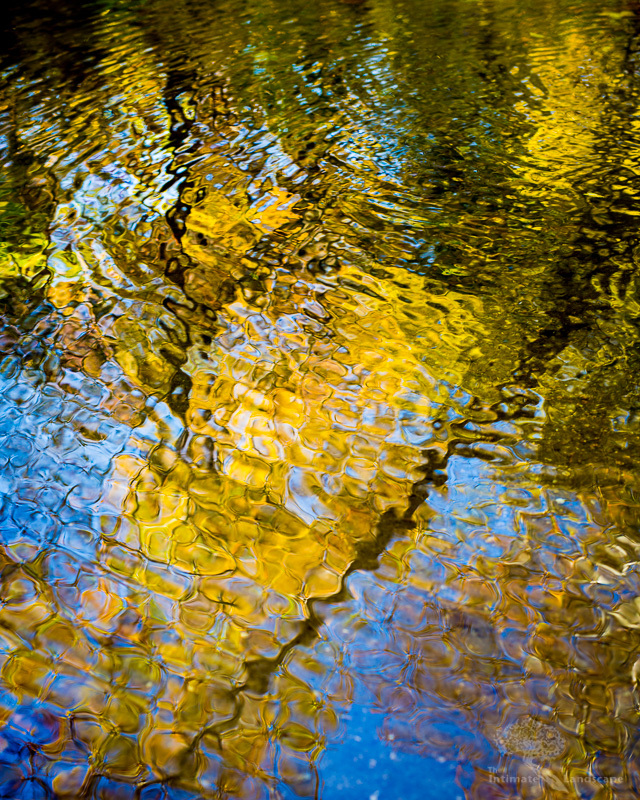 Fall foliage reflected in a stream creates an impressionist image. In northwest Virginia, near the border with West Virginia and Maryland, outside the famous town of Harper’s Ferry, there is area near the Potomac River called the Potoma Wayside. I have no idea who dropped the ‘c’ off the name. However, if you venture down the trail from the parking area, there is a small waterfall near where Piney Run empties into the Potomac. A nice pool forms at the base of this waterfall and when the light is right and the foliage is colorful, the ripples in the pool will break the reflections into colorful abstracts. The image above was shot using a Nikon D800 and a Sigma 50mm ART lens. I experimented with various shutter speeds until I got just the right one to capture how the ripples break up the reflections into individual cells. In this case, I used a shutter speed of 1/40th of a second at f/2.5, ISO 100. This entry was posted in Landscape Photography, Potomac River, technique and tagged abstract, autumn, Fall Colors, Harper's Ferry, impressionistic, Trees, water.